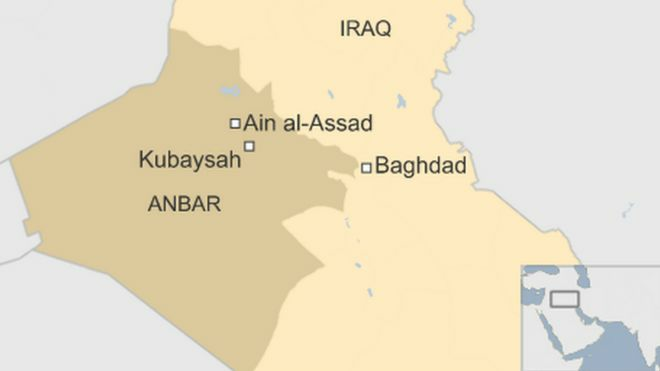 A British suicide bomber has carried out an attack on Iraqi forces in Anbar province, in western Iraq, the so-called Islamic State group has claimed. A militant named as "Abu Musa al-Britani" used a car bomb to target a convoy of Iraqi army and aligned Sunni forces, "killing nearly 30", it said. However, Iraqi military disputed the claims, saying it believed only the bomber died in the attack. The group made the claim on its account on the messaging app Telegram. The name "Abu-Musa al-Britani" - the kind of name taken by a militant when they go to fight - suggests that the man was British. IS claimed he attacked the convoy after it had left Ain al-Assad military air base and was heading towards Kubaysah in the north-west of the province. Earlier on Monday, IS claimed another attack in western Al-Anbar, carried out, it said, by five suicide bombers, including a French, a Turkish and a Jordanian, whose pictures it published. The BBC's Baghdad bureau said Iraqi military had confirmed three Iraqi soldiers were killed and four others wounded in an attack involving four suicide car bombs in Albu Obaid, north-east of Ramadi, the capital of Anbar province, at dawn on Monday. The Iraqi military's Anbar Operations Command denied claims made by pro-IS sites that 30 Iraqi soldiers were killed in the attacks. Separately, Iraqi military sources said troops had managed to destroy four suicide car bombs around the town of Hit, and killed more than 30 IS militants. It is likely the British suicide bomber was killed in these attacks, the sources claimed.